You are here: Freebies » Pens/Office Supplies » FREE Bosco Pencil! 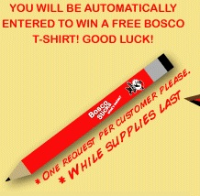 Get a FREE Bosco Pencil just for entering they will send you the FREE Pencil!! The Over 18 link is not working for me. Try using this and you get to enter a contest too. Hey thanks, Dawn. I couldn’t get it to even bring up the page. But I tried the link you supplied, and it worked. Thanks! It says “this page can not be found”.